Our family didn’t make it to an amusement park this summer, but when I was a kid, summer always meant two things: a trip to King’s Island and a new pair of shoes. Lunch was always provided by the company at the park picnic grounds — usually fried chicken with all the fixings. It was nice and all, but we really just wanted to be out riding the rides and eating salt water taffy. But the picnic was really important to my parents, because my dad’s boss, and his boss, and his boss would all be there, and we had to say hello and thank you to all of them. We had to be clean, neat, and on our best behavior, and that’s where the new shoes came in. About two weeks before King’s Island my mom would take all the kids shopping and we’d come home with new outfits and gleaming new gym shoes guaranteed to make us run faster and jump higher. But they would sit in their boxes untouched until King’s Island Day. It didn’t matter how ratty, tired or worn out our old shoes were — we weren’t allowed to wear our new ones until “King’s Island Day”, and by golly we’d better keep them (and our new clothes) good and clean until all the bosses and their bosses had seen us at lunch. The worst thing we could do that day would have been to embarrass my dad in front of all of those bigwigs. 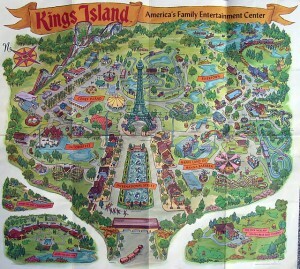 What I experienced first at King’s Island as a little kid is magnified about a hundred times in high school. It’s amazing how much appearances matter isn’t it? We work so hard to impress others. We have to have the “right” look (whatever that is) and we have to act a certain way to maintain a certain status, or to simply avoid being shunned or ridiculed. But when was the last time you acted or dressed or spoke a certain way to impress Jesus? Do you ever work hard to make him proud to call himself your brother or glad that he died for you? Have you ever said, “I sure hope I see JC in the halls today”? When was the last time you went out of your way to make sure He noticed you? Do you ever get so excited about seeing him at Mass that you got butterflies in your stomach? As you go back to the hallowed halls of your school this fall, please remember that for the only Boss who really matters, your soul is infinitely more precious than your soles. Sure we want to be presentable on the outside, but it’s the state of our inner life that determines our relationship with God. He sees past your shoes and your hair and your complexion into your deepest self and he passionately loves you for you. But so often we fail to return that love. Sure it’s tough to keep our shoes from getting scuffed up as kids, but you and I both know it’s nothing compared to trying to keep our souls clean. As you go through this school year, choose wisely who you want to impress. When you’re in relationship with Jesus, you get to spend time with the BMOC (Big Man on Cosmos), and not only does he invite you to sit at his table, he shares his very Body and Blood with you. And when you make a mess of yourself when you find yourself scuffed and smudged and torn, he won’t mock or reject you. No, he’ll make you clean again. Now that’s a boss worth impressing. Enjoy these last days of summer! And may God richly bless your school year. Joe Ollier is a Catholic husband and father of four. He has almost 20 years experience in parish youth ministry and a Masters Degree in Theological Studies from the University of Dayton. Joe is currently the Coordinator of Youth Ministry at the Church of the Ascension in Kettering, OH, where he and his family are parishioners. His monthly “Jottings from Joe” can be found in the YouthNews on the Ascension Parish Youth Ministry website: www.ascensionkettering.org/youth-ministry.